On Thursday last week I wrote a piece here about why I thought the UKIP annual conference might be a turning point. Gawain Towler, the party’s press officer, tweeted that this was ‘interesting’: obviously, he knew more about how potentially turning it might be. One could argue that UKIP has never had a good annual conference in its 21 years: either the party is in high dudgeon, or someone goes badly off-message (Kilroy in 2004, Bloom last year). This weekend’s event, held on Ed Miliband’s doorstep in Doncaster, showed that in this at least, the party is capable of operating in a more professional way. From the stage and the intro music, through the tight, media-friendly programme, to the big surprise presentation of Mark Reckless as their newest recruit, the party leadership have benefited from money and good media management. At yet, the old party habits die hard. During this year, UKIP has tried hard to recast itself as being more than just the Nigel-Farage-Show: spokesmen have been appointed – largely from the newly swollen ranks of MEPs – and policy announcements have been trailed very largely by them. Farage himself only have one policy point in his two speeches: reform of postal voting, which had the feel of a coincidence between party attack’s on Labour in Rotherham and Douglas Carswell’s project for reforming Westminister. But despite this, almost all the media coverage of the conference was still on Farage, and he was the central figure in presenting Reckless at the end of the Saturday, just as attention was shifting towards the Conservative’s meeting in Brimingham. It was Farage’s attitude towards Douglas Carswell that was the most interesting, however. Carswell, looking set to become UKIP’s first elected MP, was greeted with cheers and plaudits by the audience and Farage made much of his principle in resigning his seat, to force a by-election. Farage’s exact words were ‘brave and noble’, which when coupled to ‘when Douglas fights for election on the 9th of October’, had a certain sense of distancing. The overall impression was that Carswell will be largely left to his own devices, both in the campaigning (where his personal brand counts for much) and in the longer-run (where his libertarian views will clash with others in the party). Farage isn’t going to let himself become tied to Carswell’s fortunes – or Reckless’, for that matter – which makes sense both from a strategic view and from his own leadership style: highly personalised and intolerant of challenge. This brings us nicely to the second old habit: ideology and policy. UKIP was founded on a policy of disaffection: European Union membership as a bad thing. It has gradually built out from that one policy, mostly notably into immigration, but still with a negative construction of policies – these are the things we don’t like. Where the party has always struggled is in agreeing on the reasons for disliking something and in the solutions to those problems. The result has been a policy portfolio that hasn’t really advanced from the disowned 2010 manifesto: removing fees for parking in hospitals and separate queues for UK citizens at immigration points (two of the announcements in Doncaster) do not constitute a coherent world-view. Even the proposals to flatten tax bands were not connected to a wider macro-economic package, while Jane Collins, the Employment spokesman, chose to use most of her time to develop the party’s attack on Labour in Rotherham. Farage made a rare excursion in his speech into foreign policy, but only to say that intervention largely didn’t work: no alternative idea of how to engage with the world was offered. The rhetorical shift towards libertarianism of the past couple of years remains just that: rhetoric. Carswell and Reckless might have been drawn in partly by this, but the party contains too many different interests to let this have full force (for an excellent demonstration of what you can debate on Twitter, follow this replies on this from the Wall Street Journal’s Simon Nixon). Even, the populist/Poujadist argument looks rather ambitious: the interests of the common man are only advanced as motivations when it suits the party, rather than in a structural way. Instead, the party remains deeply grounded in the politics of protest for the sake of protest. This has been a very successful strategy for them to date and has allowed them to tap into all manner of policy issues: Farage is unhappy with the promises made by other parties in the run-up to the Scottish independence campaign, the party will abolish student fees for STEM subjects, and so on. But this is not an ideology, only a modus vivendi. This was most clearly seen in the much-heralded swing in attention to fighting Labour. Building on the back of work by Rob Ford and Matthew Goodwin, the party has recognised the ripe possibilities for drawing in the ‘left-behinds’ that have traditionally voted Labour. Much of Friday was devoted to laying the ground for new challenges on this, and Farage himself talked explicitly about how his was a party that was for all-comers. And yet, this message was deeply under-cut by the presentation of Mark Reckless, as the second defection in a month from the Tory backbenches to UKIP. The opportunity it represented – to stick the knife very deeply into David Cameron, and to give further momentum in the period up to the general election – was simply too good to pass up. 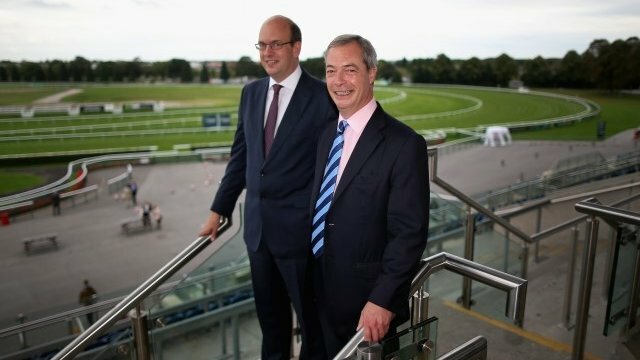 For some of those potential Labour swing voters, seeing another balding, public-school educated, intellectually-minded Tory joining Farage is going to make the jump harder to do. Even if Reckless’ value to the party is much smaller in electoral terms than Carswell – he is much less likely to win his by-election – he has shown that the anti-politics message can work. The very fact of the by-elections will strengthen UKIP’s claim to be on the side of positive change: no back—room deals for them, will be the message. That both Reckless and Carswell fall into what John Major would have called the ‘Bastards’ is neither here nor there at the moment: it is the image that counts, even if that complicates practicalities on the ground. Obviously, UKIP has to take the chances – and make them – when it can. This weekend represents one of its very best outings ever. Whether it can translate that into seats next May remains to be seen. This post originally appeared on the PSA Blog on 29 Sept, and is reproduced with kind permission.